This morning I (Paul) decided to test the postprandial (post-meal) glucose effects of 125g of watermelon, while simultaneously testing its effects on cognition. I tested the latter by playing speed chess with a strong computer program, which – believe me – allows little room for error. My fasting glucose was 67 mg/dl – right on the money for what I am aiming for these days. The CR Way 4 Longer Life Edition Software provides a nice breakdown of carbohydrates and sugars for watermelon, showing that only 125 g of watermelon includes 9.44g of total carbohydrates and out of that the total sugars are 7.74 g. The sugars include glucose 1.98g, sucrose 1.31g, and fructose a whopping 4.20g – very high for such a small amount of carbs. Meanwhile, the fiber is a miniscule 0.50g (the same amount of blueberries has 3.38g fiber). One might hope that the high proportion of fructose might blunt the glycemic effect (but not that the potential for increased formation of advanced glycation endproducts by fructose, so substituting it for glucose is not a good trade-off), but the results of my speed chess game told me the story even before I tested the glycemic effects of the watermelon. While starting strong and gaining an advantage, the computer tore me to pieces midway through the game. While playing, I could feel my ability to make exact calculations wane, even in the short 12 minutes allotted for the game. My glucometer told the true tale – a disappointing 26 point rise – a lot for such a small amount of carbs. My rule of thumb, developed from testing the glucose effects of foods thousands of times: Increases higher than 20mg/dl cause my concentration to wane. Nilsson A, Radeborg K, Björck I.
European Journal of Clinical Nutrition. 2009 Jan;63(1):113-20. OBJECTIVE: To find useful methods for the studies of cognitive function during a postprandial period, and to use these methods to evaluate function after test meals differing in post meal glycaemia. SUBJECTS/METHODS: Forty healthy volunteers aged 49-70 years were studied. A glucose solution (glucose 50 g) was provided through either a bolus or sipping regimen at breakfast to simulate a high-GI or a low-GI breakfast, respectively. Cognitive tests of working memory (WM) were performed at 35, 90, 120 and 150 min after commencing the breakfast, and a test of selective attention (SA) was performed at 170 min. RESULTS: Subjects with higher glucose tolerance performed better in the cognitive tests (P<0.05). After entering glucose tolerance as covariate, the subjects performed better in the working memory test at 90 min (P<0.034) and in the selective attention test at 170 min (P<0.017) after the simulated low-glycaemic index (GI) breakfast compared with the simulated high-GI breakfast. CONCLUSION: Possibly, the cognitive functions tested were enhanced by avoiding a sharp decline in blood glucose concentration and by maintaining a higher glycaemia in the late postprandial period, respectively. A low-GI diet is preferable in the prevention of the risk of cognitive decline as a result of less efficient glucose regulation. RATIONALE: Glucose is the main metabolic fuel of the brain. The rate of glucose delivery from food to the bloodstream depends on the nature of carbohydrates in the diet, which can be summarized as the glycemic index (GI). OBJECTIVES: To assess the benefit of a low versus high GI breakfast on cognitive performances within the following 4 h.
METHODS: The influence of the GI of the breakfast on verbal memory of young adults was measured throughout the morning in parallel to the assessment of blood glucose levels. The learning abilities of rats performing an operant-conditioning test 3 h after a breakfast-like meal of various GI was also examined. RESULTS: A low GI rather than high GI diet improved memory in humans, especially in the late morning (150 and 210 min after breakfast). Similarly, rats displayed better learning performance 180 min after they were fed with a low rather than high GI diet. CONCLUSION: Although performances appeared to be only remotely related to blood glucose, our data provide evidence that a low GI breakfast allows better cognitive performances later in the morning. Including indigestible carbohydrates in the evening meal of healthy subjects improves glucose tolerance, lowers inflammatory markers, and increases satiety after a subsequent standardized breakfast. Nilsson AC, Ostman EM, Holst JJ, Björck IM. The Journal of Nutrition. 2008 Apr;138(4):732-9. Low-glycemic index (GI) foods and foods rich in whole grain are associated with reduced risk of type 2 diabetes and cardiovascular disease. We studied the effect of cereal-based bread evening meals (50 g available starch), varying in GI and content of indigestible carbohydrates, on glucose tolerance and related variables after a subsequent standardized breakfast in healthy subjects (n = 15). At breakfast, blood was sampled for 3 h for analysis of blood glucose, serum insulin, serum FFA, serum triacylglycerides, plasma glucagon, plasma gastric-inhibitory peptide, plasma glucagon-like peptide-1 (GLP-1), serum interleukin (IL)-6, serum IL-8, and plasma adiponectin. Satiety was subjectively rated after breakfast and the gastric emptying rate (GER) was determined using paracetamol as a marker. Breath hydrogen was measured as an indicator of colonic fermentation. Evening meals with barley kernel based bread (ordinary, high-amylose- or beta-glucan-rich genotypes) or an evening meal with white wheat flour bread (WWB) enriched with a mixture of barley fiber and resistant starch improved glucose tolerance at the subsequent breakfast compared with unsupplemented WWB (P < 0.05). At breakfast, the glucose response was inversely correlated with colonic fermentation (r = -0.25; P < 0.05) and GLP-1 (r = -0.26; P < 0.05) and positively correlated with FFA (r = 0.37; P < 0.001). IL-6 was lower (P < 0.01) and adiponectin was higher (P < 0.05) at breakfast following an evening meal with barley-kernel bread compared with WWB. Breath hydrogen correlated positively with satiety (r = 0.27; P < 0.01) and inversely with GER (r = -0.23; P <0.05). In conclusion, the composition of indigestible carbohydrates of the evening meal may affect glycemic excursions and related metabolic risk variables at breakfast through a mechanism involving colonic fermentation. The results provide evidence for a link between gut microbial metabolism and key factors associated with insulin resistance. Note that barley kernels not only lowered glucose, but increased energy stabilizers like glucagon and adiponectin, while lowering IL-6 (associated with increased inflammation) right in line with the biochemistry that must be in place happen to realize CR benefits. 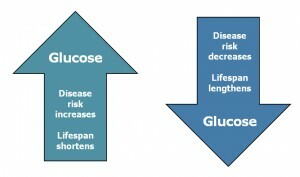 Besides its effect on cognition, high postprandial glucose would likely shut down beneficial biochemistry associated with longevity. For more on this, note the actions of AMP Kinase and its sensitivity to glucose levels as seen here in the new and all-important Essential Cell Signaling in Science Behind the Benefits on the left navigation menu.